I earned my undergraduate degree in electrical engineering in 1996 from Politehnica University of Bucharest, Romania, with a specialization in applied electronics/computing systems. I continued my education at the University of Notre Dame, where I earned my Ph.D. in electrical engineering in 2004. At the University of Notre Dame my research work has been focused on the development of algorithms for the supervision of event-driven systems. This research has been done in the context of control systems, at the border between control systems and computer science. After finishing my graduate studies, I have applied this research work to the automatic synthesis of concurrency control code in multithreaded software. 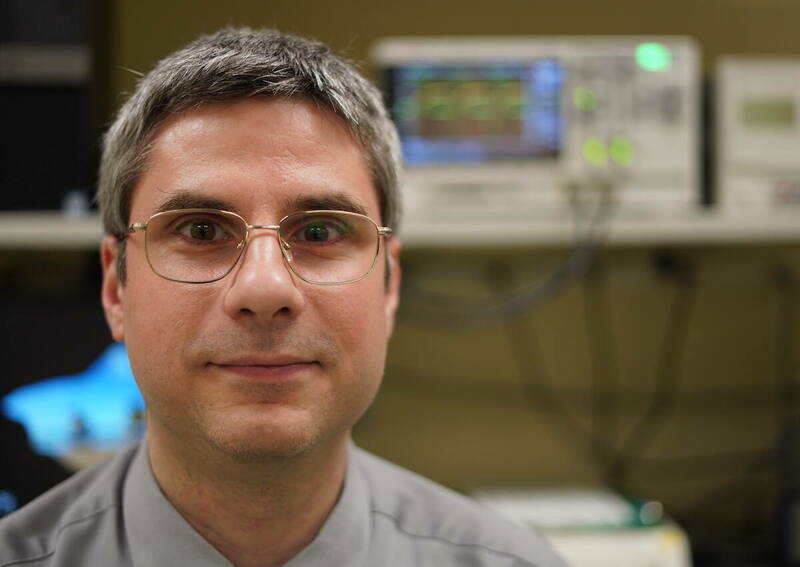 Since 2004, I have been a member of the electrical-engineering faculty of LeTourneau University. My current focus is teaching. I enjoy teaching, and I enjoy every class that I teach. In my free time I like to study the Bible. I love the Bible and I seek to interpret it the way it interprets itself. I have been a born-again Christian since 1998. You may read my testimony on my website, at http://mviordache.name/. Iordache, M.V. and P.J. Antsaklis (2006), Supervisory Control of Concurrent Systems: A Petri Net Structural Approach, Birkhauser Boston. Iordache M. V. and P. J. Antsaklis (2010), "DES abstractions for the supervisory control of hybrid systems", in Transactions of the Institute of Measurement and Control, 32(5), pp. 468--486. Iordache M. V. and P. J. Antsaklis (2006), "Supervision Based on Place Invariants: A Survey," in Discrete Event Dynamic Systems, 16, pp. 451--492. Iordache M. V. and P. J. Antsaklis (2006), "Decentralized Supervision of Petri Nets," in IEEE Transactions on Automatic Control, 51(2), pp. 376--381. Iordache M. V. and P. J. Antsaklis (2003), "Design of T-Liveness Enforcing Supervisors in Petri Nets," in IEEE Transactions on Automatic Control, 48(11), pp. 1962--1974. Iordache M. V. and P. J. Antsaklis (2003), "Synthesis of Supervisors Enforcing General Linear Vector Constraints in Petri Nets," in IEEE Transactions on Automatic Control, 48(11), pp. 2036--2039. Iordache M. V., J. O. Moody and P. J. Antsaklis (2002), "Synthesis of Deadlock Prevention Supervisors using Petri Nets," in IEEE Transactions on Robotics and Automation, 18(1), pp. 59-68. Iordache M. V., P. Wu, F. Zhou, P. J. Antsaklis (2013), "Efficient design of Petri-net supervisors with disjunctive specifications," in the Proceedings of the 2013 IEEE International Conference on Automation Science and Engineering, pp. 936-941. Iordache M. V. and P. J. Antsaklis (2013), "The ACTS software and its supervisory control framework," in the Proceedings of the 51st International Conference on Decision and Control, pp. 7238-7243. Iordache M. V. and P. J. Antsaklis (2010), "Limitations of Liveness in Concurrent Software Systems," in the Proceedings of the 49th International Conference on Decision and Control, pp. 3252-3257. Iordache M. V. and P. J. Antsaklis (2010), "Concurrent program synthesis based on supervisory control," in the Proceedings of the 2010 American Control Conference, pp. 3378-3383. Iordache M. V. and P. J. Antsaklis (2009), "Petri Nets and Programming: A Survey," in the Proceedings of the 2009 American Control Conference, pp. 4994-4999. Iordache M. V. and P. J. Antsaklis (2007), "Petri Net Supervisors for Disjunctive Constraints," in the Proceedings of the 2007 American Control Conference, pp. 4951-4956. Iordache M. V. and P. J. Antsaklis (2006), "Reduction of the Supervisor Design Problem with Firing Vector Constraints," in the Proceedings of the 8th International Workshop on Discrete Event Systems, pp. 215-221. Iordache M. V. and P. J. Antsaklis (2005), "A Structural Approach to the Enforcement of Language and Disjunctive Constraints," in the Proceedings of the 2005 American Control Conference, pp. 3920-3925. Iordache M. V. and P. J. Antsaklis (2004), "Resilience to Failures and Reconfigurations in the Supervision Based on Place Invariants," in the Proceedings of the 2004 American Control Conference, pp. 4477-4482. Iordache M. V. and P. J. Antsaklis (2004), "On a Class of Controlled Invariant Sets," in the Proceedings of the 2004 American Control Conference, pp. 2522-2527. Iordache M. V. and P. J. Antsaklis (2003), "Decentralized Control of Petri Nets," in the Proceedings of the Workshop on Discrete Event Systems Control, of the International Conference on the Application and Theory of Petri Nets (ATPN 2003), pp. 143-158. Iordache M. V. and P. J. Antsaklis (2003), "Decentralized Control of Petri Nets with Constraint Transformations," in the Proceedings of the 2003 American Control Conference, pp. 314-319. Iordache M. V. and P. J. Antsaklis (2002), Decentralized Control of Petri Nets, Technical Report of the ISIS Group, ISIS-2002-005, University of Notre Dame. Iordache M. V. and P. J. Antsaklis (2002), "Synthesis of Supervisors Enforcing General Linear Vector Constraints in Petri Nets," in the Proceedings of the 2002 American Control Conference, pp. 154-159. Iordache M. V., P. J. Antsaklis (2001), "T-liveness enforcement in Petri nets based on structural net properties," in Proceedings of the 40th IEEE International Conference on Decision and Control, pp.4984-4989. Iordache M. V., P. J. Antsaklis (2001), "Generalized Conditions for Liveness Enforcement and Deadlock Prevention in Petri Nets," in Applications and Theory of Petri Nets 2001, LNCS vol.2075, pp. 184-203. Iordache M. V., J. O. Moody, P. J. Antsaklis (2001), "A Method for the Synthesis of Liveness Enforcing Supervisors in Petri Nets," in the Proceedings of the 2001 American Control Conference, pp.4943-4948. Iordache M. V., J. O. Moody, P. J. Antsaklis (2000), "A Method for the Synthesis of Deadlock Prevention Controllers in Systems Modeled by Petri Nets," in the Proceedings of the 2000 American Control Conference, pp. 3167-3171. Moody J. O., M. V. Iordache, P. J. Antsaklis (1999) "Enforcement of event-based supervisory constraints using state-based methods," in the Proceedings of the 38th IEEE Conference on Decision and Control.